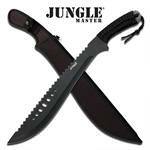 Jungle Master Premium Stainless Steel Full Tang Fixed Blade Machete Knife. 25 Inch Overall in length Stainless Steel. 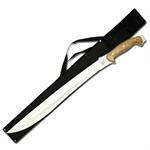 Featuring wooden handle, Comes with the nylon sheath. 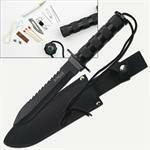 11.25" Overall, 5.75" Blade, 4.5" Handle Black blade with reverse double serration. 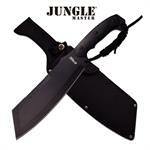 Jungle Survival Knife with Black Finish. 28 Inch Survival Machete with Black Handle With Orange Rim. Sawback spine. Lanyard hole with cord, Includes nylon sheath. 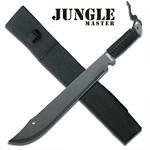 21" Overall Jungle Master Sawback Black Machete With Sheath. Features Black Cord wrapped handle. 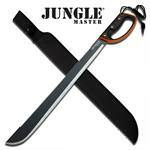 21 Inch Overall in length Jungle Master Machete With Cord Wrapped Handle. Includes nylon sheath.